We perform tough cleaning, spot removal, filtration soiling cleaning and odor control, including pet urine deodorizing. We also offer the option of using the nation's premier carpet sanitizing agent for your peace of mind on particularly soiled areas. Commercial carpet cleaning can be scheduled one time or you can take advantage of our commercial maintenance services. Professional cleaning is less expensive than most do-it-yourself methods, especially in commercial settings. Additionally, professional carpet cleaning is always safer than rentals or cheap portable cleaners that can actually damage your carpets. When you have a pesky rug stain, the most important thing to remember is not to use any harsh chemicals. Most of the time, the formulas for carpet stain removal that are being sold in stores are intended for synthetic carpet fibers, and not for wool, silk, or other premium rug fibers. Carpet is a major investment for any home or workplace. It’s a semi-permanent part of your flooring that you’ll be keeping for the next several years. Since you’ll be using it for the foreseeable future, it’s in your best interest to maintain your carpet well so that it retains its good looks and extends its lifespan. Pettyjohn’s Cleaning offers residential and commercial carpet cleaning. We can tailor a program to meet your specific needs and offer everything from the one-time cleaning when you are moving into your new home, to regular carpet maintenance in your home or facility. We ensure tough cleaning, spot removal, filtration soiling cleaning and odor control, including pet urine deodorizing. We also offer the option of using the nation’s premier carpet sanitizing for your peace of mind on particularly soiled areas. Commercial carpet cleaning can be scheduled at one time cleanings or you can take advantage of our commercial maintenance services. Professional carpet cleaning is less expensive in the long run than most do-it-yourself methods, especially in commercial settings. Additionally, professional carpet cleaning is always safer than rentals or cheap portable cleaners that can actually damage your carpets and not provide a thorough rinse. Vacuum – Most cleaners skip this step thinking it won’t make a difference, don’t be fooled. Did you know that 75% of all soiling in your carpet is dry particulate soiling? Most of the dry particulate soiling can be removed with a vacuum. Pre Spraying – Pettyjohn’s uses a natural wool safe approved pre-spray. The added benefit is that there is virtually no odor. There is also a disinfectant added to all pre-spray. Agitation – Agitation is accomplished by the use of a counter-rotating brush that brushes the chemical into all the fibers of the carpet. The counter-rotating brush also pulls even more unwanted fibers from the carpet- things like hair and string. Dwell Time – Most chemistry needs time to work and you deserve the maximum benefits of the service you are buying. Extraction – Once the pre-conditioner has done its job, it’s time to rinse it out. Pettyjohn’s Cleaning uses up to 240-degree temperature water (when appropriate) and the most powerful suction available to rinse and extract the cleaning agents and soiling. Grooming – Grooming is necessary because it allows the carpet to dry evenly and in its natural position. Drying – Although our suction removes the cleaning agents and soiling there is usually a small amount of water left behind. Pettyjohn’s Cleaning uses powerful air movers to start the drying process. 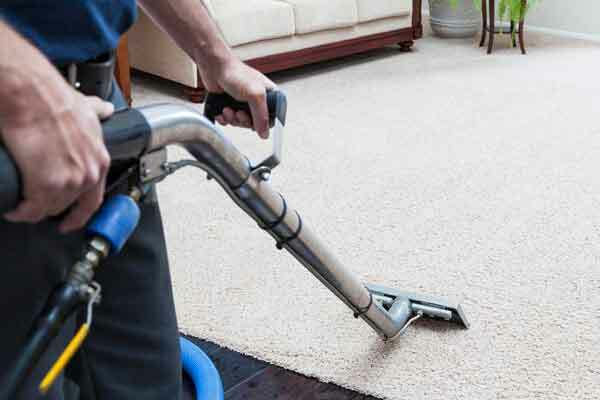 Most carpets are dry within a few hours of cleaning. Why Choose Pettyjohn’s Carpet Cleaning? Are you looking for the best carpet cleaner in the Raleigh NC area who are fast, and someone who provides a high quality of services? Look no further than Pettyjohn’s Cleaning. We have the knowledge, expertise, and products to remove any type of stain on your carpet, rug, and floors. When you get a new carpet in your home, you want to keep it clean. So if you have a spill or stain on your carpet fibers, you want it cleaned, and fast! Pettyjohn’s Cleaning has its own proprietary carpet cleaner products. We have tested different carpet cleaners on fresh stains and those that had set into the carpet for a while to see what works best. No more guessing on how to remove these carpet stains, all you need to do is call Pettyjohn’s Cleaning today. To locate a professional carpet cleaning company.